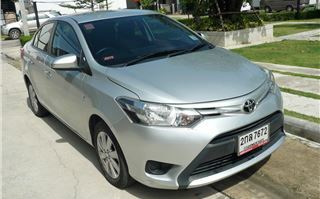 The Toyota Vios 4-door sedan is the most popular car in The Philippines, Malaysia and Thailand and also sells well as a cheap 5-seater in Japan and the USA. 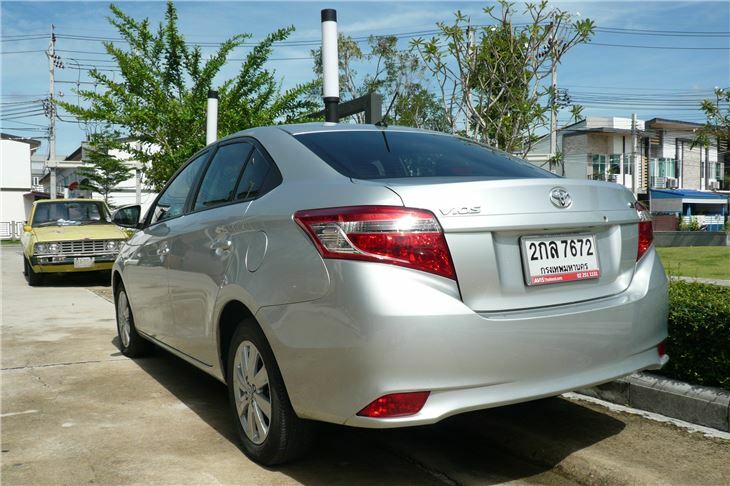 I lucked in with my September 2014 rental from Avis Bangkok and got the latest model Vios 1.5E automatic, as launched in Thailand in March, 2013. 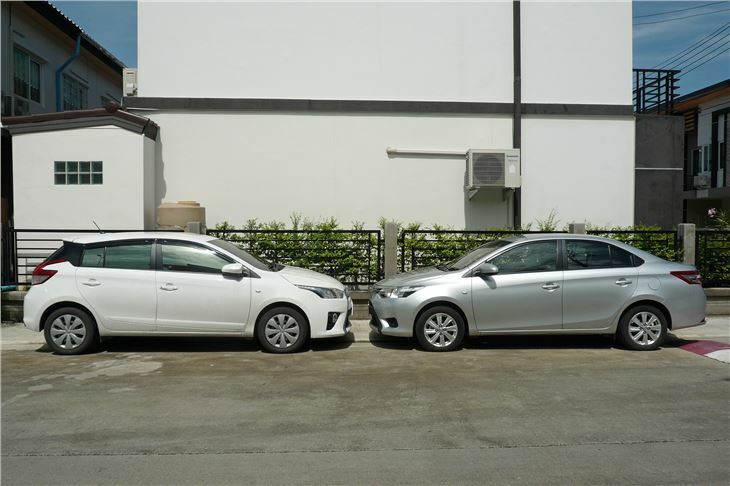 This is the third generation of Vios, described as a ‘subcompact sedan’. 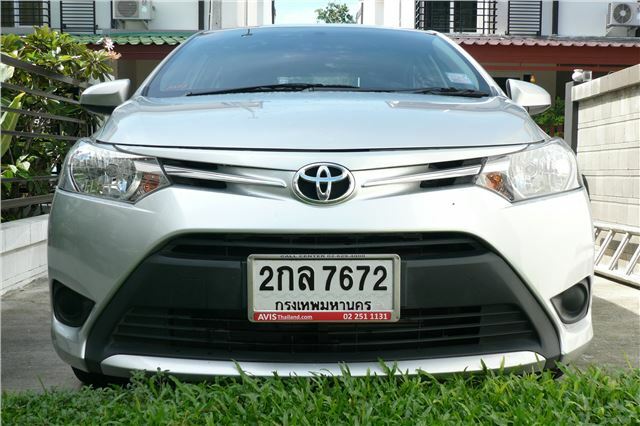 It’s a full 5-seater the size of an Auris or a Focus in the UK, powered by a 107PS version of Toyota’s ageing but reliable 1NZ-FE 1,497cc VVT-I engine, in our case bolted to a reliable 4-speed torque converter automatic transmission. No one with any credibility is ever going to give the Vios III an award for styling. It looks as if the designers have struggled to make it bigger, yet cheaper and at the same time more imposing than before. What is a bit creative is the ‘double bubble’ roof design, possibly inspired by Zagato (or by the need to make the roof more rigid). If you don’t hold third you stay in ‘Eco’ mode and the box will upshift to 4th whenever it can. 4th gives 25mph per 1,000rpm. The seats are comfortable with long squabs. The driver’s seat is height adjustable. There’s plenty of legroom in the back. And, for a car of this size, the load area is huge: 970mm long and up to 1,470mm wide (though only 1,030mm between the wheelarches). 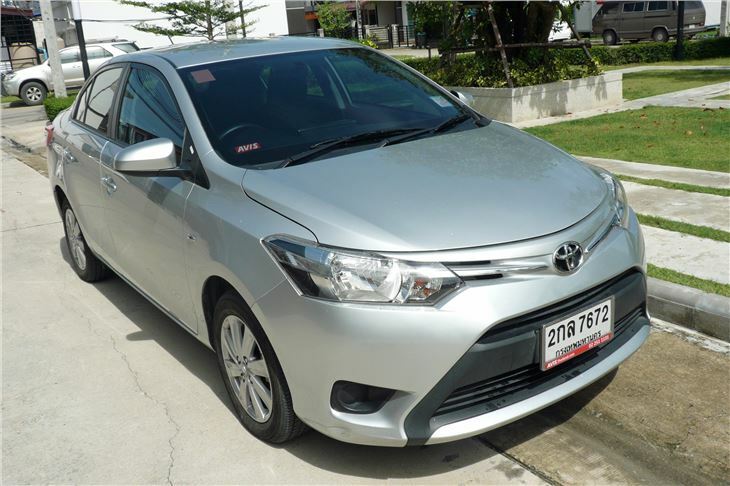 The 2014 Vios gets a passenger airbag (the previous generations of Vios didn’t), which might give some protection to the two or three children typically milling around the front seat in Thailand. Rear facing baby seats are virtually unheard of except by the super rich, so, though there’s a warning, the passenger airbag is not switchable. 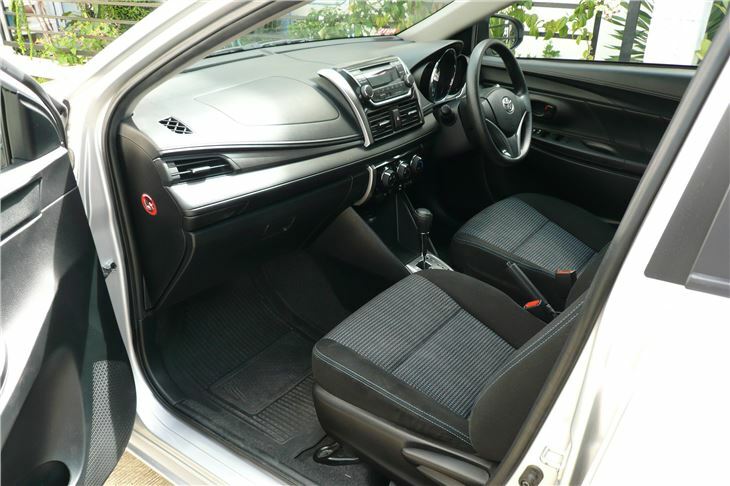 But the car does have ISOFIX tethers for the outer two rear seats, three lap/diagonal inertia reel seatbelts and three rear head restraints that retract into the backrests. Trim is fabric, in our car quite a pleasant mix of black and blue. The plastic simulated leather dash, steering wheel boss and door trims with moulded pseudo stitching won’t be to everyone’s taste, but the height adjustable steering wheel rim is the right thickness and is pleasant enough to hold. The E version also gets electric mirrors and using them it’s surprisingly wieldy to reverse park into a slot between cars parked across the front of the bay (standard Thai car park etiquette: they leave their brakes off and their transmissions in neutral). Other minor pleasures are grab handles above both front doors. 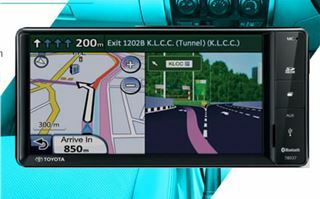 And the FM radio is exactly in your line of sight so you don’t crash into the car in front trying to find stations. It also has Aux and USB sockets built into its fascia. 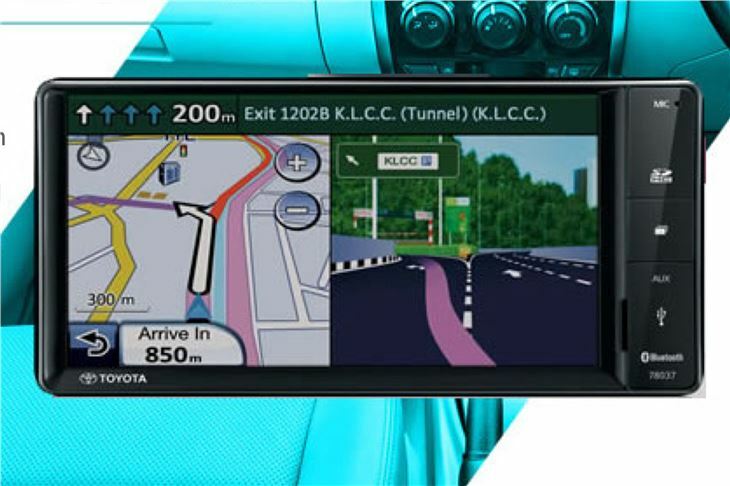 Posher G models have a touch screen radio and you can substitute it with an optional wide screen DVD Audio Video Navigation System and reversing camera. 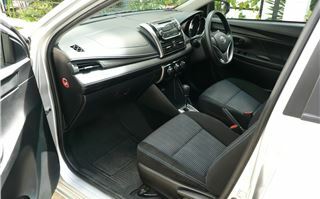 There are cupholders in the centre console front and back and springing out of the dash, and bottle holders in the front door pockets. Official fuel economy is an optimistic 44.8mpg, but most local reviewers were seeing low to mid 30s. 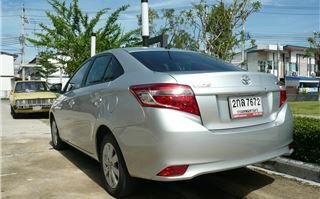 On our first fill of mixed motoring in and around Bangkok, most of it in heavy traffic, we think we got 33mpg. 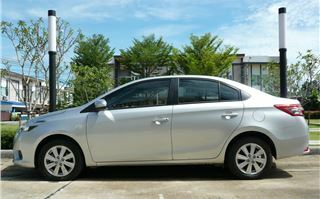 Altogether I’ve driven at least 30,000 miles in various Vios, from a 2003 automatic bought new through three automatic Mk IIs and two manuals to this latest version. The 2003 automatic managed 150,000 kilometres with no engine or transmission problems and was showing 40mpg plus on a long run. The three automatic Mk IIs showed no problems either, but one of the manuals had a low-speed hesitation and the other had lost some synchromesh between 3rd and 4th. So an automatic is clearly the way to go.